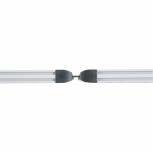 Arista Cantilever Cable Management Leg Cover Pair Silver (Pack of 2) KF73887 Pack of 1 Designed to fit Arista Cantilever desks. Covers legs up to 730mm tall. Aids cable management. 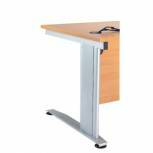 Gives your office or home desk a neat and tidy finish. In keeping with the design of the Arista desk. Non returnable. 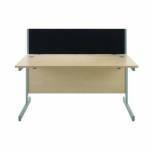 Jemini Black 800mm Straight Desk Screen KF73910 Pack of 1 Jemini Straight Desk Screen 800mm Black KF73910. Each screen comes with a pair of clamps. Rigid linking strips available upon request. Aluminium square end posts. Dimensions: W800 x D30 x H400mm. Non returnable. 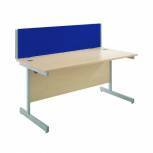 Jemini Blue 800mm Straight Desk Screen KF73911 Pack of 1 Jemini Straight Desk Screen 800mm Blue KF73911. Each screen requires a pair of clamps. Dark grey powder coated aluminium side trims. Dimensions: W800 x D30 x H400mm. Non returnable. Jemini Black 1200mm Straight Desk Screen KF73912 Pack of 1 Jemini Straight Desk Screen 1200mm Black KF73912. Each screen requires a pair of clamps. Dark grey powder coated aluminium side trims. Dimensions: W1200 x D30 x H400mm. Non returnable. Jemini Blue 1200mm Straight Desk Screen KF73913 Pack of 1 Jemini Straight Desk Screen 1200mm Blue KF73913. Each screen requires a pair of clamps. Dark grey powder coated aluminium side trims. Dimensions: W1200 x D30 x H400mm. Non returnable. Jemini Black 1400mm Straight Desk Screen KF73914 Pack of 1 Jemini Straight Desk Screen 1400mm Black KF73914. Each screen requires a pair of clamps. Dark grey powder coated aluminium side trims. Dimensions: W1400 x D30 x H400mm. Non returnable. 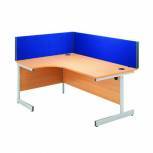 Jemini Blue 1400mm Straight Desk Screen KF73915 Pack of 1 Jemini Straight Desk Screen 1400mm Blue KF73915. Each screen requires a pair of clamps. Dark grey powder coated aluminium side trims. Dimensions: W1400 x D30 x H400mm. Non returnable. 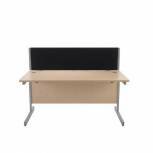 Jemini Black 1600mm Straight Desk Screen KF73916 Pack of 1 Jemini Straight Desk Screen 1600mm Black KF73916. Each screen requires a pair of clamps. Dark grey powder coated aluminium side trims. Dimensions: W1600 x D30 x H400mm. Non returnable. Jemini Blue 1600mm Straight Desk Screen KF73917 Pack of 1 Jemini Straight Desk Screen 1600mm Blue KF73917. Each screen requires a pair of clamps. Dark grey powder coated aluminium side trims. Dimensions: W1600 x D30 x H400mm. Non returnable. Jemini Black 1800mm Straight Desk Screen KF73918 Pack of 1 Jemini Straight Desk Screen 1800mm Black KF73918. Each screen requires a pair of clamps. Dark grey powder coated aluminium side trims. Dimensions: W1800 x D30 x H400mm. Non returnable. Jemini Blue 1800mm Straight Desk Screen KF73919 Pack of 1 Jemini Straight Desk Screen 1800mm Blue KF73919 Each screen requires a pair of clamps. Dark grey powder coated aluminium side trims. Dimensions: W1800 x D30 x H400mm. Non returnable. Jemini Black 1200mm Wave Desk Screen KF73922 Pack of 1 Jemini wave Desk Screen 1200mm Black KF73922. Each screen comes with a pair of clamps. Rigid linking strips available upon request. Aluminium square end posts. Dimensions: W1200 x D30 x H200-400mm. Non returnable. Jemini Blue 1200mm Wave Desk Screen KF73923 Pack of 1 Jemini wave Desk Screen 1200mm Blue KF73923. Each screen comes with a pair of clamps. Rigid linking strips available upon request. Aluminium square end posts. Dimensions: W1200 x D30 x H200-400mm.. Non returnable. Jemini Black 1600mm Wave Desk Screen KF73926 Pack of 1 Jemini wave Desk Screen 1600mm Black KF73926. Each screen comes with a pair of clamps. Rigid linking strips available upon request. Aluminium square end posts. Dimensions: W1600 x D30 x H200-400mm. Non returnable. 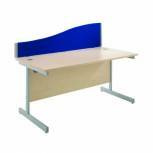 Jemini Blue 1600mm Wave Desk Screen KF73927 Pack of 1 Jemini wave Desk Screen 1600mm Blue KF73927. Each screen comes with a pair of clamps. Rigid linking strips available upon request. Aluminium square end posts. Dimensions: W1600 x D30 x H200-400mm. Non returnable. 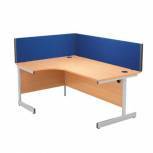 Jemini Blue 1500mm Straight Desk Screen KF74004 Pack of 1 Jemini Straight Desk Screen 1500mm Blue KF74004. Each screen comes with a pair of clamps. Rigid linking strips available upon request. Aluminium square end posts. Dimensions: W1500 x D30 x H400mm. Non returnable. 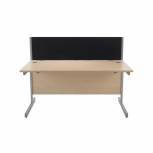 Jemini Black 1500mm Straight Desk Screen KF74005 Pack of 1 Jemini Straight Desk Screen 1500mm Black KF74005 Each screen comes with a pair of clamps. Rigid linking strips available upon request. Aluminium square end posts. Dimensions: W1500 x D30 x H400mm. Non returnable. 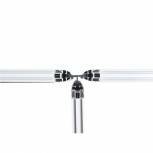 Jemini 2 Way Rigid Linking Strip For Desktop Screen KF74162 Pack of 1 To link together 2 desk screens. Ideal for neat, self-contained desk spaces. Promotes privacy and productivity. Non-returnable. Jemini 3 Way Rigid Linking Strip For Desktop Screen KF74163 Pack of 1 To link together up to 3 desk screens from a central junction. Ideal for neat, self-contained desk spaces. Promotes privacy and productivity. Non-returnable. 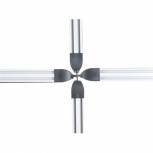 Jemini 4 Way Rigid Linking Strip For Desktop Screen KF74164 Pack of 1 To link together up to 4 desk screens in a cross formation. Ideal for neat, self-contained desk spaces. Promotes privacy and productivity. Non-returnable.